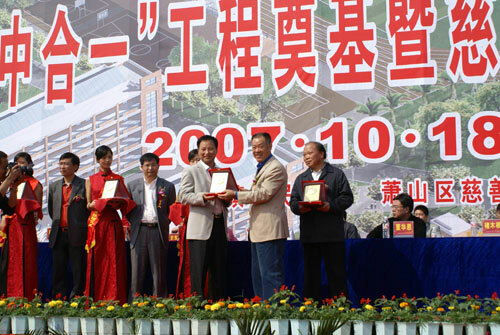 Zhu Hua, the vice secretary of the Xiaoshan District Committee announced the start of the "junior and senior high school unification" project of Heshang Town on Oct. 18th, 2008. Qiu Chao, the standing member of Xiaoshan District Committee and the director of the Department of Publicity; Li Jinda, the deputy direct of the Standing Committee of Xiaoshan District People's Congress; deputy district chief Zhang Ailian; Dong Hua'en, vice chairman of the Political Consultative Conference of Xiaoshan District; Cai Renlin, the director general of the Education Department of Xiaoshan District and Chu Mugen, the chairman of the Charity Federation of Xiaoshan District attended the ground breaking ceremony to launch the foundation of the "junior and senior high school unification" project. 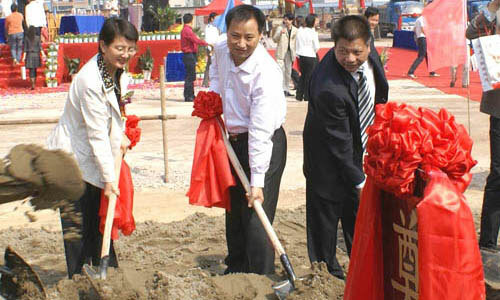 Wu Jianliang, the head of Heshang Town, hosted the foundation ceremony. Wei Guohua, Matsuoka Mechatronics president, who has a dedicated interest in culture, education and charity, was also invited in the meeting. As a well known enterprise in Xiaoshan, Matsuoka has always been a strong source of support for education. It has donated two charity primary schools as well as a foundation for "orphans in rural China". This time, the company will donate RMB 3 million for the "junior and senior high school unification" project in Heshang Town. Education is the cornerstone of national growth. President Hu Jintao put forward six major areas to accelerate social development focusing on improving people's livelihood and to transform China into a country with a highly educated population and respected education institutions using social resources. In recent years, the Heshang Town Party Committee and the Government have put emphasis on developing education, and have worked hard on the "junior and senior high school unification" project and engrained a atmosphere of respect for both teachers and education. As a result, the town has developed a community feeling based on "the party giving priority to education, policy being based on learning and the public proud to support schooling". As the largest infrastructure-invested project ever in the history of Heshang Town, the "senior and junior high school unification" project will merge Heshang Town Senior High School and Daqiao Junior High School to new facilities renamed Heshang High School. With a total investment of RMB15 million Yuan and total floor area of 27,000 square meters, the project will be divided into two phases and will include two comprehensive modern school buildings, an administrative building, a laboratory building, a dormitory for the teachers and the students, as well as dinning halls, multi-functional sports & arts center and the playground. The buildings will be landmarks in Heshang Town.